Answer: The cost of laminate flooring will vary based on its color, its brand name, the vendor that sells it, the width of the plank and the quality of its construction. Generally you can find laminate flooring for under $2 per square foot. However, some products can cost over $3 per square foot and others can cost under $2 per square foot. Can I install a laminate floor myself? Answer: The answer to this question depends on your construction skills. Most people can install a laminate floor themselves if they have the help of one or two people. To get the best results read through the installation instructions before you start putting your floor together, make sure that you have all of the equipment that you need to install your floor correctly, and finally make sure that you do all of the recommended prep work before you start putting your floor together. How long will it take to put my laminate flooring together? Answer: Again the answer to this question will depend on your construction skills. It will also depend on the size of the area that you are trying to cover and on how many people are helping you. You should be able to cover an average sized living room floor in about 8 hours. Answer: You can install laminate flooring any where you want, even in bathrooms. The only thing that you will need to keep in mind if you install your laminate flooring in a bathroom or kitchen is that you will need to wipe up spills and splatters quickly to avoid warping. What manufacturers make laminate flooring? Answer: There are a lot of manufacturers that produce laminate flooring. Some of the manufacturers that produce laminate flooring include: Mannington, Wilsonart, Alloc, BHK, Armstrong and Balta. Where can I buy laminate flooring? 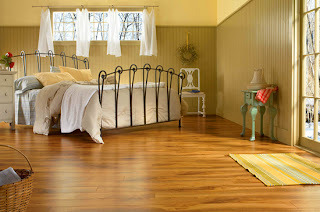 Answer: You can find laminate flooring in home improvement stores, construction outlets, flooring outlets and online. What looks can I create with laminate flooring? Answer: Laminate flooring comes in the same colors and woods as hard wood floors come in. 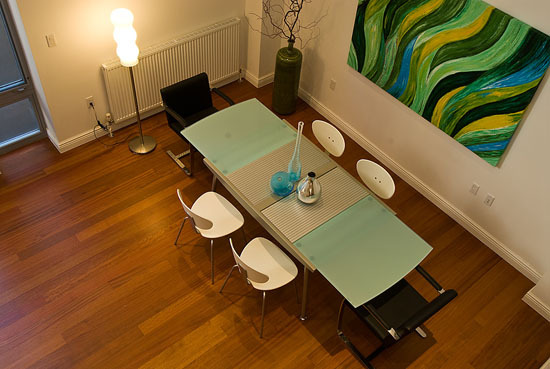 You can find laminates of oak, mahogany, exotic woods and domestic woods. Is there a bamboo laminate flooring product? Answer: Yes. You can buy bamboo laminate flooring. How do I clean a laminate floor? Answer: Cleaning a laminate floor is very simple. All you need to do is sweep it to remove debris and dust, and wipe it with a damp cloth to remove scuffs and small spills.